Kasha Ki Aasha is proud to present an evening with New Yorker, Daniel Roth, and international vocalist, Kranti Cheon this Saturday starting at 8 pm. Daniel Roth studied at the prestigious Berklee College of Music in Boston and played in the clubs of Greenich Village in New York with some of the best like Muddy Waters, Ray Charles, Concha Buika and toured the world five times with Joe Cocker. Roth now is based in Europe and plays with The Vibe alongside the renowned saxaphonist, Norbert Fimple. 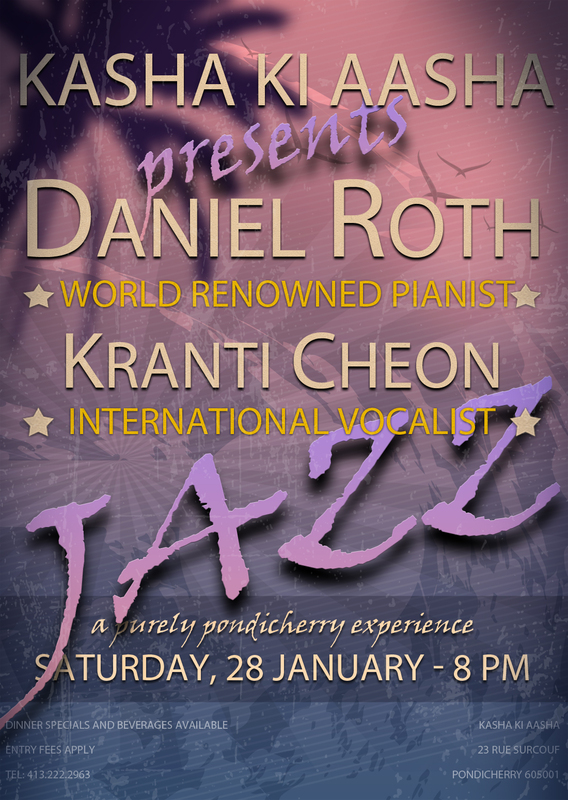 Daniel Roth is renowned for his dynamic piano solos on jazz blues and his Brazilian music improvisation. We also welcome back international jazz vocalist, Kranti Cheon who is based in Auroville and has made this performance possible.